What a treat it is to have Amanda Epperson, PhD joining us here on Genealogy Gems! Amanda is an expert on Scottish genealogy research, and is the author of The Family Tree Scottish Genealogy Guide. 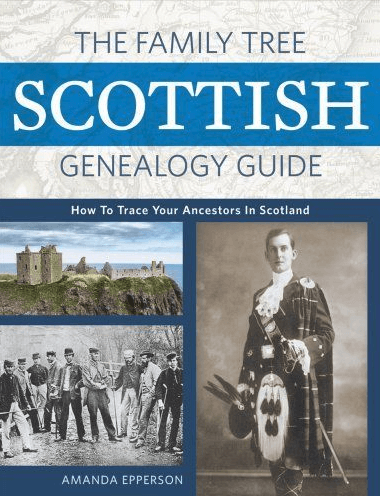 If you even suspect that you have Scottish roots keep reading because Amanda is about to share some of her top strategies to help you find your ancestors in Scottish records. If your love of tartan, bagpipes, and kilts equals your love of family history research, you are likely hoping to find an ancestor who was born in Scotland. Or perhaps nothing would surprise you more than to find a Scottish ancestor. In either case, the next step is to find this ancestor in Scottish records. As with all immigrants, the first step to finding them in their homeland is to research their lives extensively in America before searching for them in Scottish records. Once you do that, use these three strategies to locate your ancestor in Scottish records. First, determine whether your Scottish-born ancestor arrived in the United States before or after 1855, the year Statutory (or Civil) Registration began in Scotland. This year is an important divide in Scottish Genealogy. Before 1855, you will need to start your research with the Old Parish Records (commonly known as the OPR) and after 1855 you can use the Statutory Records. With this knowledge, you will be able to organize your research and manage expectations of the data you will find. If your ancestors came to America after 1855, then they and their relatives should be included in Statutory records. These records are extremely detailed and each type invariably includes the name of an individual’s parents. Parish records are an amazing resource, but they are not complete and were not well-kept in all parishes. Consequently, many people do not appear in the OPR. Indexes for parish records are available at many websites (for example https://www.familysearch.org). Images of these documents can be viewed at your Local Family History Center or an affiliate library (https://www.familysearch.org/locations/). Statutory Registration records (called civil records in the FamilySearch catalog) are partially indexed at FamilySearch and select years are also available at your local Family History Center. ScotlandsPeople (https://www.scotlandspeople.gov.uk/) has a complete set of OPR and Statutory Records available on a pay-per-view basis. 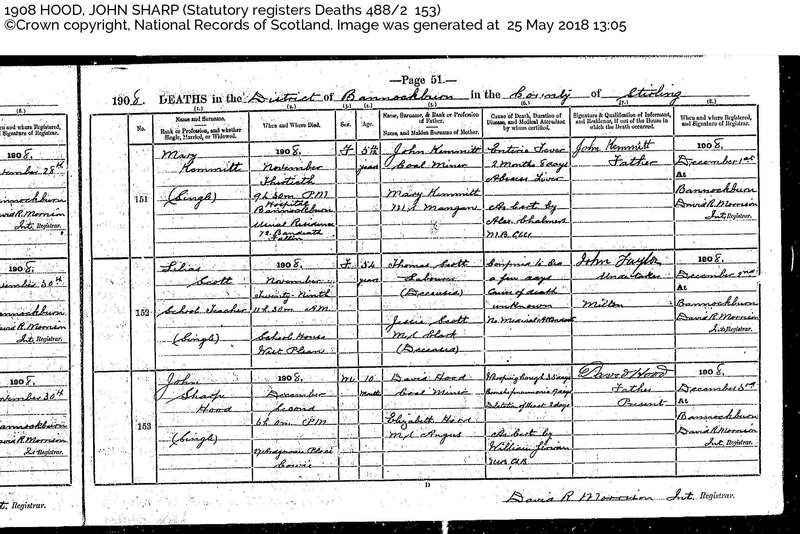 Image above: When you download Statutory records from ScotlandsPeople, like this death record for John Sharp Hood, complete citation information is included. Photo Credit: 1908 Hood, John Sharp (Statutory Register of Deaths 488/2) ©Crown copyright, National Records of Scotland. Second, determine your ancestor’s Scottish birth place. 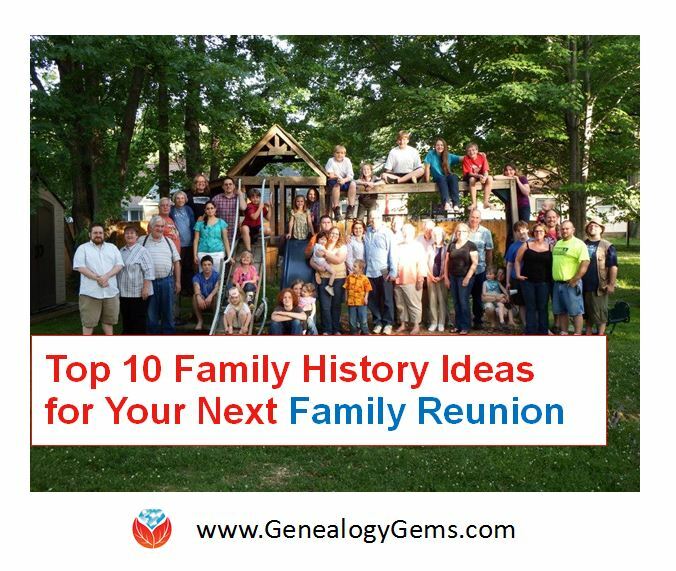 The name of the parish is best, but you may be able to manage with just the county if you ancestor’s name was uncommon or you know the names of several of their family members. Check available U.S. records for this information. For example: vital records, post-1906 Naturalization records (before this date Naturalizations usually only record the country of origin), passenger lists, county or local histories, or in correspondence. If you are really lucky, you may find your ancestor in the series of books by David Dobson who mines both U.S. and U.K. records for emigrant Scots. Several of his books are available at Ancestry.com and are searchable. Location is a key fact because many Scots have the same name and many surnames (like Smith, Campbell, and Stewart) are quite common. Additionally, the same surname does not guarantee a family relationship, even for more uncommon names. Many passenger lists record an emigrant’s last place of residence, which for Europeans was their place of birth. However, due to high rates of internal migration in Scotland, this may not be true for many Scottish immigrants. Keep an eye out for other locations associated with you ancestor; also be sure to check if the passenger list records the name and residence of the immigrants nearest relation in the old country. It is possible that this is your ancestor’s actual place of origin. 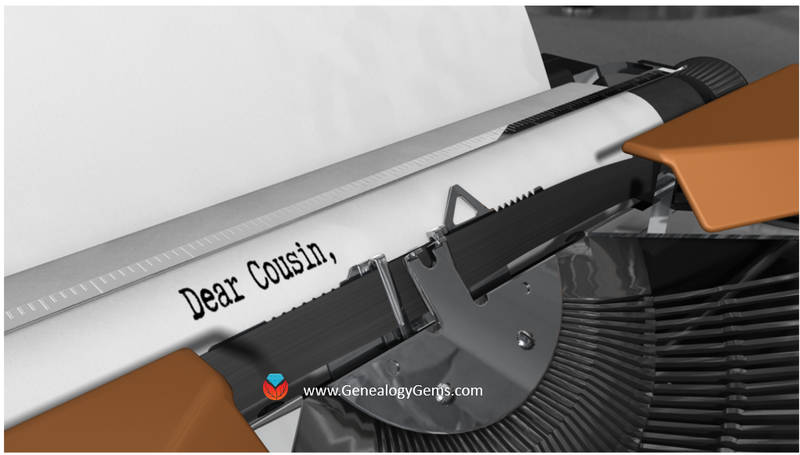 Click the image to get the book (thanks for using our links and supporting the free Genealogy Gems Podcast. Third, determine all variations of your ancestor’s first and last names, especially if your ancestor was from the Scottish Highlands. In this region, the bulk of the population spoke Scots-Gaelic until the nineteenth century. However, all church records were kept in English, even if the minister spoke Scots-Gaelic. This meant that all Gaelic names, both first and last, needed to be rendered in English. There was often no consistency in how this was done. Some English renderings were reasonably close to the Scots-Gaelic name, but others were inspired by biblical or Latin names. Two commonly interchangeable first names include Donald and Daniel, and Angus and Aeneas. Highlanders also easily changed surnames, especially when moving from the land of one landlord to another. These name changes are often included in parish registers as an “alias” as in McIntosh alias Cattanach. And when Gaelic speakers moved south, they often Anglicized their surnames, so MacThoimish in Inverness became Thomson in Glasgow. You can learn more about interchangeable names in a brief article by Alan G. McPherson (https://www.clan-macpherson.org/museum/documents/alang12.pdf). While finding any immigrant ancestor can be a challenge, and Scots are no different, there is the advantage that most of the records are in English, are easily available, and many of have been indexed. 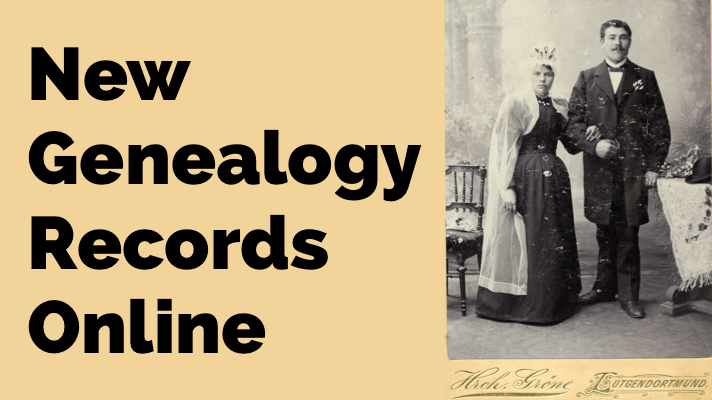 Following these three basic steps will help you identify your ancestors in Scottish records. 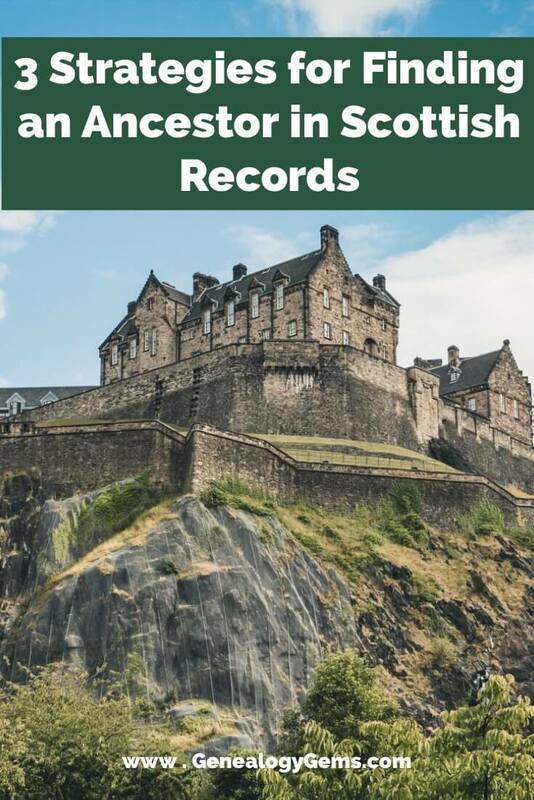 Read more about newly available Scottish records here at Genealogy Gems. Amanda Epperson is the author of the book The Family Tree Scottish Genealogy Guide. 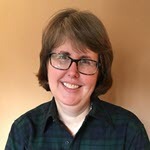 Since completing her Ph.D. in history from the University of Glasgow in 2003, Amanda has taught history at the college level, researched and edited family histories, most recently for Genealogists.com, and written articles for a variety of publications including Family Tree Magazine and Your Genealogy Today. She blogs occasionally at the Scottish Emigration Blog. I know my ancestors were from Scotland but I can’t find the link to that country. The family lived in Kent County, DE since the late 1700s, but I don’t know when they came from Scotland. Could you help me with a suggestion of how to find the family prior to Morris or Maurice McBride in Kent County DE, please? Hi Carol, That’s a complicated question and without all the particulars unfortunately it isn’t possible to answer it here. Truly the best answer is to get a copy of Amanda’s book. It is impressively comprehensive and will help you formulate your research process and identify the right sources to solve this and also identify what is not available, which as we know, is as important to know as what is. Wishing you the very best in your search!